Also referred to as the Legion or the LSH, the adventures of the team are published in two monthly titles Legion of Super-Heroes and Legionnaires (referred to as LSH and L* respectively). Set in the 30th Century, the LSH are a group of 20 or so (very young) super-teens nominally representing the United Planets UP. 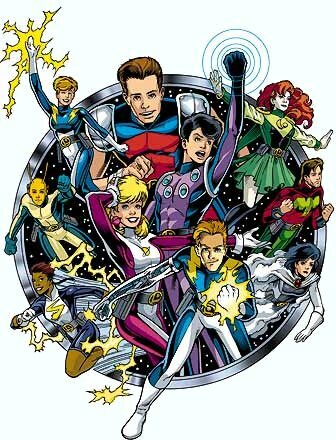 The core team (of LiveWire, Saturn Girl & Cosmic Boy) formed after saving the multi-billionnaire industrialist, RJ Brande, who subsequently bankrolled the team, with many more members joining subsequently. Simple, huh? Well yes and no. Nominally, their adventures begin with LSH 0 & Legionnaires issues 0, circa 1994, but the team first appeared in a somewhat different incarnation as throwaway characters in Adventure Comics #247 wa-a-ay back in 1959. However, they proved so popular that they quickly graduated to regular appearences in Superboy, Action Comics and Adventure Comics before finally graduating to their own series. Unfortunately, over the years continuity discrepancies crept in, due to stories set in their future and to changes in the main DC continuity, particularly the Crisis of Infinite Earths series and Superboy's subsequent disappearence from the Superman mythos. Superboy had played a crucial rôle in many important events in LSH continuity, even providing the inspiration for the Legion's formation. A gap had appeared in LSH continuity. Rather than simply shifting the required emphasis onto another character, an ersatz "pocket" Universe (complete with ersatz Superboy) was created to plug the continuity gaps. Things were getting messy. There was a massive retroactive change to continuity (retcon) circa LSH v3 #5. Literally the entire Universe was swept away and replaced by another virtually identical Universe, but without Superboy. Instead Mon-El (renamed Valor) & new character Andromeda took his place, both as inspiration and as story keystones. With v3 the stories took on a grittier slant, with the LSH now grown up, Earth being occupied by the alien Dominators, being liberated, the moon being destroyed and ulitmately the Earth itself being destroyed (you can't get much grittier than that!). Along the way a set of youthful duplicate Legionnaires was picked up. The question of which set was the real LSH and which the copies was never resolved. Things were getting messier. With Zero Hour, the creative team threw up their hands in despair (understandably), unable to resolve and explain all the disparate continuity problems, and the LSH was re-booted. So now we have all-new stories set in an all-new continuity with largely the same cast but with no reliance on any previously established continuity. So, now the LSH can be enjoyed on many different levels. Purely on the basis of the present stories, or the earlier stories (as back issues or in the Archive volumes) can be explored as a basis for comparison with the current incarnation or purely for the pleasure they give in their own right. You know, when I come to think about it, there are already several, very good intros to the Legion, you're probably better off looking at them, anyway (see my links page)!